Like the brain, immune system is remarkable for the tenacity of its memory One of the awesome features of your immune system is that it can remember a pathogen it has encountered before!!! Remembering things past! -- Does our immune system really have a memory? Common cold, fever, cough etc.. These happen all the time with us. When we accept any change, pick up our kindergartener or travel to the Canary Islands. We are under attack, continuously! It all takes place on a microscopic level. Microbes, like bacteria and viruses, love to find us and make us their home. Intense fighting goes on between our immune system and the unwanted microbes. And usually we don’t notice a thing. Presumably this is because our defenses are acquainted with the intruder from before and know exactly what to do to get rid of it. Rooting out the troublemaker generally happens quickly, efficiently and virtually painlessly. So how is the body able to recognize an enemy that it has fought off before? Does our immune system really have a memory? Of the thousands of bacteria and viruses in the world, of course there are some which our body has never seen before. That’s why we get vaccines. When we go to the doctor to get a vaccine, we are actually being injected with a form of whatever virus or bacteria we are trying to prevent! Scientists today have engineered vaccines that are very safe. Some vaccines don’t even use the whole virus or bacteria, but merely a part of it. Our B cells pick up the vaccine and begin making antibodies and memory cells against it. The next time our body encounters that virus or bacteria, our B cells will be ready to produce the right antibodies against it. How can the immune system recognize for the next time when it attacks and produces specific antibodies against antigens? Let us read on to know more facts regarding this!! Immune system – Powerful army of cells that fights against diseases The immune system is made up of a network of cells, tissues, and organs that work together to protect the body. Our body generally defends us against anything that is not recognized as being part of or belonging in our body. The immune system is the body's defense against invasion of antigens such as bacteria, viruses, pollen, additives, certain foods, and others. When a person is first introduced to an antigen, such as a flu virus, the immune system makes an antibody, or protective chemical, to fight off the invader. 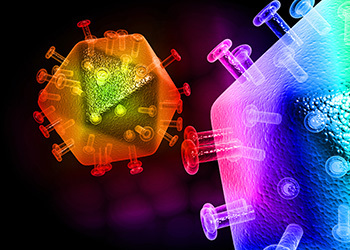 The next time the person is exposed to the same flu virus, the immune system remembers, recognizes the invader, and releases the specific antibodies that react with the virus and destroy it. Incredibly, the immune system can produce antibodies with the identical shape of the antigen they must bind with point for point in order to eliminate the antigen, allowing the person to recover. Our immune system's capacity for memory allows us to develop immunities. When our immune system knows what a germ looks like, it can stop any new infections before we get sick again. That means we are immune to that particular germ. Antibodies are made by white blood cells called lymphocytes, which originate in bone marrow and circulate through the bloodstream, patrolling all areas of the body to identify and protect against foreign invaders. When the lymph nodes in the body swell, it's actually because they're filling up with these cells which will attack the invader. The body’s “strategy” for defending against foreign organisms, cells, or molecules has three phases. Destroy the specific type of foreign cell or molecule that enters the body. Illustrating primary and secondary immune responses The secondary immune response occurs when the second time (3rd, 4th, etc.) the person is exposed to the same antigen. At this point immunological memory has been established and the immune system can start making antibodies immediately. This occurs as a result of primary contact with an antigen. Immunological memory refers to the ability of the immune system to respond more rapidly and effectively to a pathogen that has been encountered previously. 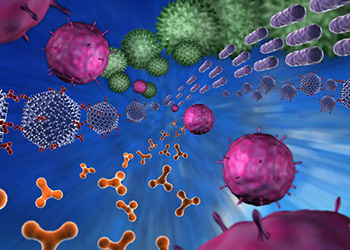 Immunological memory is a distinct characteristic of the immune system and it relates to its ability to remember antigens on pathogens, tumor cells, tissue of the immunological self, and cells and tissues derived from other individuals of the species and mount an immunological response of greater magnitude and with faster kinetics upon re–encounter of the same antigens. This property provides an advantage in the course of protective responses against pathogens and tumor cells. 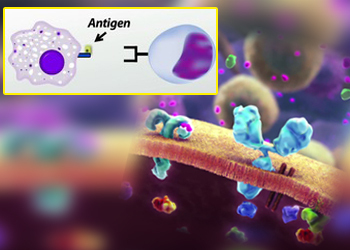 The first time an antigen enters the body, only a few lymphocytes can recognize it. Those lymphocytes must be located and stimulated to divide to produce an army of lymphocytes ready to eliminate that particular antigen. 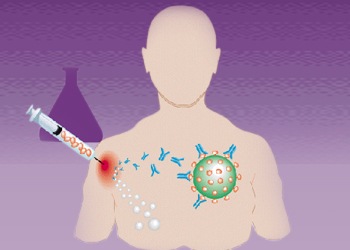 The primary immune response occurs when an antigen comes in contact to the immune system for the first time. During this time the immune system has to learn to recognize antigen and how to make antibody against it and eventually produce memory lymphocytes. The secondary immune response occurs when the second time (3rd, 4th, etc.) the person is exposed to the same antigen. At this point immunological memory has been established and the immune system can start making antibodies immediately. 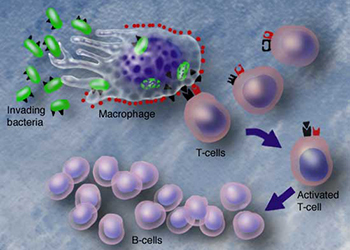 Special types of T- and B-cells 'remember' the invader, making you immune to a second attack. T- and B-cells are highly specialized defender cells - different groups of cells are tailored to different germs. When your body is infected with a particular germ, only the T- and B-cells that recognize it will respond. These selected cells then quickly multiply, creating an army of identical cells to fight the infection. Certain white blood cells, called lymphocytes, are responsible for both the specificity and the memory of the immune response. There are two principal types of lymphocytes. They are the B lymphocytes, or more simply B cells, and the T lymphocytes, or T cells. Both the types form in the bone marrow, but they mature in different organs of the body. It is thought that B cells mature in the bone marrow. (However, the B is now a useful reminder that B cells mature in the bone marrow). The T cells, on the other hand, mature in the thymus gland, which overlies the heart. (The T stands for thymus gland). As lymphocytes mature, they are programmed to recognize only one particular type of antigen. This recognition is the basis of the specificity of the immune response. Each lymphocyte develops receptors – molecules with a unique shape – on its surface. Indeed, thousands of identical receptor molecules pepper the surface of each lymphocyte. When an antigen fits into a lymphocyte’s receptors, the body’s defenses target that particular antigen. Because of the tremendous diversity of receptor molecules, each type on a different lymphocytes. T- and B-cells recognize invaders by the shape of molecules - antigens - on their surfaces. Immune system can produce a T- and B-cell to fit every possible shape. During the primary response, the one that occurs during the body’s first encounter with a particular antigen, is relatively slow. 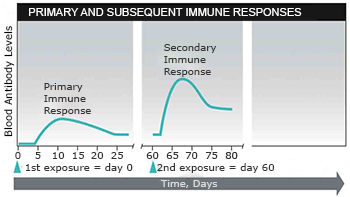 During the primary response, a lapse of several days occurs before the antibody concentration begins to rise. The concentration does not peak until 1 to 2 weeks after the initial exposure to the antigen. Following subsequent exposure to the antigen, the secondary response is strong and swift. Recall that when virgin B cells and T cells were stimulated to divide, they produced both effector cells (Effector cells are the relatively short-lived activated cells that defend the body in an immune response. Effector B cells are called plasma cells and secrete antibodies, and activated T cells include cytotoxic T cells and helper T cells, which carry outcell-mediated responses.) that actively defended against the invader and memory cells (a long-lived lymphocyte capable of responding to a particular antigen on its reintroduction, long after the exposure that prompted its production.). These memory B cells and T cells live for years or even decades. Thus, the number of lymphocytes programmed to respond to that particular antigen is greater than it was before the first exposure. When the antigen is encountered again, each of those memory cells divide and produces effector cells and memory cells specific for that antigen. As a result, the number of effector cells rises quickly, and within 2 or 3 days reaches a higher peak during the secondary response. This process is the reason we do not get chickenpox twice. The ability to remember a specific pathogen and to respond more rapidly after subsequent exposure to it is the defining feature of active immunity. In lay terms, at least, the idea of immunity has become synonymous with memory: an animal is said to be 'immune' if they have a strong memory response. Vaccination depends fundamentally on immunological memory, and the potency of certain vaccines attests to the pre-eminence of memory as the cornerstone of the vertebrate immune response. In active immunity the body actively participates by producing memory B cells and T cells following exposure to an antigen. Active immunity happens naturally whenever a person gets an infection. Fortunately, active immunity can also develop through vaccination, a procedure that introduces a harmless form of the disease-causing microbe into the body to stimulate immune responses against that antigen. In some vaccines, those for whooping cough and typhoid fever for instance, the microbe is inactivated before the vaccine is prepared. These inactivated vaccines usually consist of the cell walls of bacteria, the toxins of bacteria that have been made ineffective, or the protein coats of viruses. Other vaccines must be made from live organisms to be effective. In these cases, the microbes are first weakened so that they can no longer cause disease. Some vaccines, including the one against small pox, are prepared from microbes that cause related but milder diseases. Because memory cells are produced, active immunity is relatively long lived. The first dose of a vaccine causes the primary immune response, and antibodies and some memory cells are generated. In certain cases, especially when inactivated antigens are used in the vaccine, the immune system may “forget” its encounter with the antigen after a time. 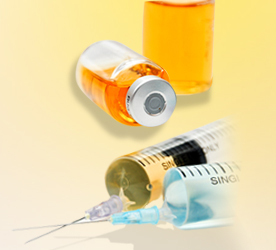 A booster is administered periodically to be sure the immune system does not forget. The booster results in a secondary immune response and enough memory cells to provide for a quick response should a potent form of that pathogen ever be encountered. Indeed, vaccination is one of the most important medical interventions ever developed and has arguably prevented more deaths than any other in human history. The successful eradication of smallpox and possible near-term eradication of polio by effective vaccination programs stand as fitting testaments to the potential of this approach. However, since the time of Jenner and Pasteur, the development of vaccines has been a rather hit-or-miss affair with little or no understanding of the mechanisms that underpin effective vaccination. Moreover, it is becoming increasingly apparent that the next generation of vaccines will depend crucially on fuller understanding of the mechanisms and processes that give rise to immunological memory. Passive immunity results when a person receives antibodies that were produced by another person or animal. 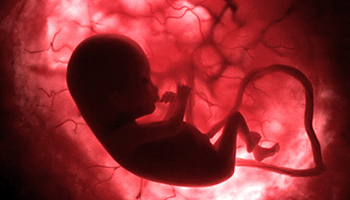 For instance, antibodies produced by a pregnant woman can cross the placenta and give the growing fetus some immunity. These maternal antibodies remain in the infant’s body for as long 3 months, after which the infant can produce its own antibodies. Antibodies in breast milk also provide passive immunity to nursing infants, especially against pathogens that might enter through the intestinal lining. The mother’s antibodies can be a temporary yet critical blanket of protection. Indeed, most of the pathogens that can threaten the health of a newborn have been seen previously by the mother’s immune system. Passive immunity provides immediate protection, but the body does not develop memory, therefore the patient is at risk of being infected by the same pathogen later unless they acquire active immunity or vaccination.